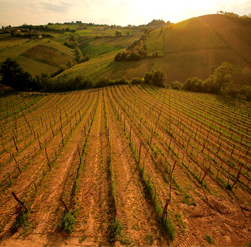 The farm is organic, and FIORANO’s respect for nature is its focal point. FIORANO’s 16 hectares of Marche countryside, on a hilltop overlooking the Adriatic Sea and the Sibillini Mountains, have been certified organic for more than 15 years. The land has been devotedly cultivated by our family, one of the first families in the area to adopt organic methods of cultivation. A family who has always believed in sustainable agriculture, to protect the quality of the food produced, of the landscape, and of life. A family who believes that making wine is not just about crushing grapes, but begins with a love of our beautiful land, and its inhabitants. A family who believes that through the high quality craftsmanship of our wine we can express the best of Italian agricultural knowledge. Because wine is not only an agricultural product, but a whole life embracing culture. The founders of the company, Antonio Massi and Adriana Stracci, together with their daughters Paola and Alessandra and son-in-law Paolo, are the life and soul of Fiorano. Drawing on previous work experiences, we have created a new spirit that is infused in our products and evidenced by our passion and hard work. The FIORANO winery was founded in 1997. The estate include vineyards, olive groves, almond groves and arable land. In 2003, we decided to start producing our own natural wine, organic from the outset, building a new organic winery from scratch. In addition, we forged a commitment to quality in the production of extra virgin olive oil, and undertook a first-rate renovation of the farmhouse, so as to be able to host paying guests. Over the years, our commitment – to an ecologically sustainable management of the winery and farm, to the recognisable style of our wines, to protecting the local environment, and to the quality of the accommodation we offer – has amply rewarded our efforts, putting FIORANO firmly on the map. 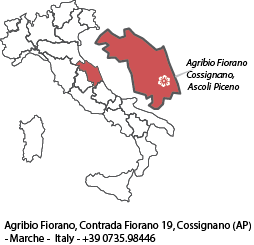 FIORANO was also co-founder of a new consortium of growers of organic brands “TERROIRS MARCHE,” which aims to enhance and promote organic viticulture in le Marche, as well as the traceability of its wines, the conservation of its lands and towns, and the diffusion of cultures and practices for sustainable and inclusive economies. This is a group of winemakers joined in symbolic union of the vineyards of the Piceno province and those of Jesi, who have been producing certified organic wines with an absolute link with the territory of origin for years. 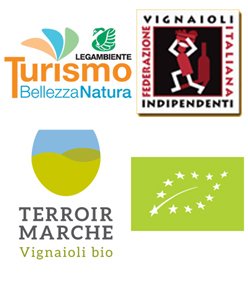 But beyond that, the Consortium TERROIRS MARCHE is a group of men and women who share – in addition to rigorous organic winemaking practice – an ethical approach to agricultural activity, which focuses on man and nature, substantive elements at the heart of the concept of terroir .